Today’s marketer can be pulled in many different directions over the course of one workday. If you’re an account manager, your day is filled with writing creative briefs, proposals, or meeting with your clients. If you’re on the creative side, your day is packed with writing digital content, such as landing pages or eblasts, or developing ad campaigns. But regardless of your position within an agency, we can all agree that there aren’t enough hours in the day to get everything done; therefore, we can’t waste precious moments fumbling through navigation menus to find a command we use all the time. 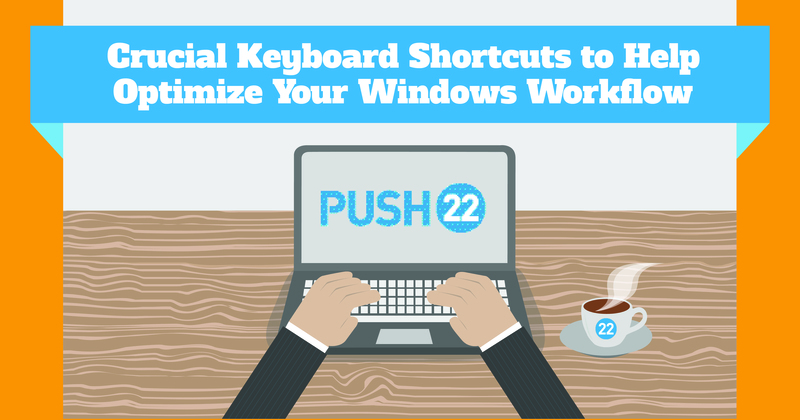 Use these keyboard shortcuts to help you increase your productivity and make every keystroke and mouse-click matter. To take a screen shot of your active window only, press ALT + PrtScn. This is really helpful when reporting bugs to your developer via email or if you run a multi-monitor system. If you want to take a full screen shot, press CTRL + PrtScn. This is a huge time save over selecting it through CTRL + ALT + DEL. To select all of the copy on the page, press CTRL + A. This is really helpful when copying lots of text from one program to another, like copying the source code for an email into a blast tool. To Copy, press CTRL + C.
To Cut, press CTRL + X. To Paste, press CTRL + V.
To get to the URL/Address Bar, press CTRL + L.
To open a New Tab, press CTRL + T.
To reopen the Last Closed Tab, press CTRL + SHIFT + T.
To open a New Window, press CTRL + N. Works in Windows Explorer as well. To open a New Incognito Window in Chrome press CTRL + SHIFT + N. This is really useful if you need to see something as a non-logged in user when you are logged into a website. To view the source code, press CTRL+U. A few seconds here and there can really add up so don’t waste any more time than you have to on keystrokes. Use these shortcuts and put your “extra” time towards getting through your to-do list. Bonus: Save, print, and pin up the image below to keep these shortcuts handy while at your desk. This post was written by J. Nolan, Lead Web Developer at PUSH 22.